Seeing this on Tuesday stopped me in my tracks. 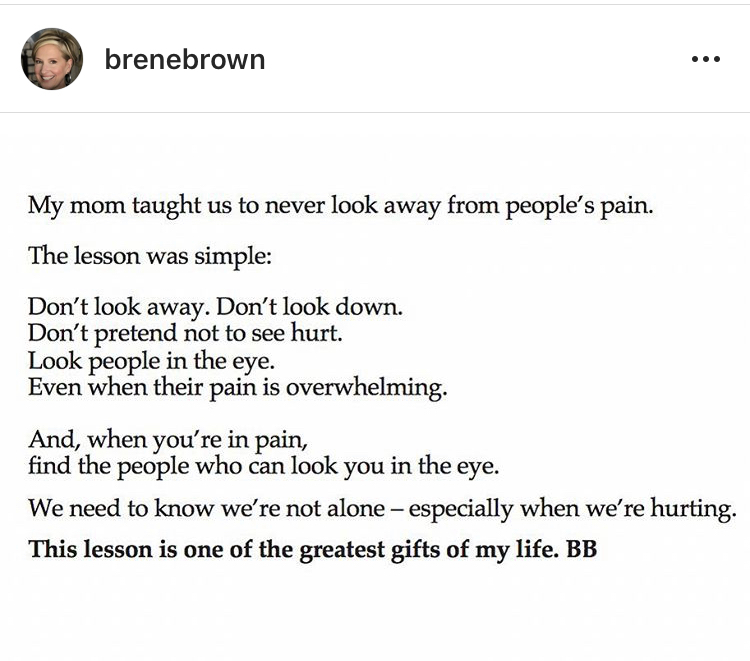 Brené Brown posted this in response to the continued aftermath of the mass shootings in Parkland and Newtown. I’m sharing it, because of my response: I was dumbstruck. I know there is pain in the world. I know I carry my own and deal with it in healthy and unhealthy ways, like I assume many people do. Until I read this though, I didn’t know WHAT TO DO about it. Two hours later I had my chance, and to be honest it felt really awkward. I was parked outside of a Starbucks on my phone, when I noticed two people talking / arguing in the car next to me. It wasn’t loud. I couldn’t tell for sure. When I looked up again, the man was gone and the woman remained in the driver’s seat leaning against the inside of the window in sunglasses, her lips and jaw clenched. The instant I realized she was crying, my eyes darted away. Because that’s what I’d done my whole life. Assumed it was private and didn’t want to pry. Not wanting to be around difficult emotions is more like it, because even a car away with the windows closed, I could feel her pain. And my own. Now, I didn’t handle it perfectly. I have a lot of learning still to do. I didn’t leave my car and knock on her window. As a deer-caught-in-headlights sort of person, it’s really hard to remember I have legs at times like these, let alone how to use them. What I did do was notice what was happening, notice my reaction, and stay present throughout. While she started shaking, the tears streaming passed her glasses and down her face, I looked over several more times. Soft glances to check in while lovingly sending her energy. I stopped working on my phone and sat with her a car away. That’s I think what Brené is asking us to do. Look people in the eye. Acknowledge our mutual, complicated, uncomfortable humanity. Stop hiding behind our phones, or fiberglass. It’s not going to be perfect, and as an A-student that’s a tough one. Wanting to know WHAT TO DO so I can get it right. Some people don’t want to be approached, or say they don’t. Some people want it and don’t know how to ask. Some people want to reach out, but don’t know how or are afraid it will be rejected. We all, everyone, have to push through that and reach out. Be present for each other, and ourselves, with tough emotions. We need to get it wrong, feel awkward, and keep at it. Yes, be scared & do it anyway. Thanks for the lesson, Brené.